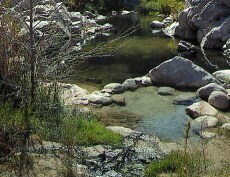 In cooperation with Santa Barbara County Parks Department and Santa Barbara City Parks and Recreation, Los Padres National Forest is closing the National Forest segments of the Jesusita Trail (27W17), the Tunnel Trail (27W14) and the Tunnel Connector Trail (27W15) in the Santa Barbara Front Country. The result of the multi-jurisdiction decision is that the three trails are closed for their entire length until further notice. The trail closures will aid in public safety on the fire damaged trails and support the collaborative effort by the County of Santa Barbara and the City of Santa Barbara to assist the disaster relief currently under way in urban interface areas of the Jesusita Fire. More information is available by calling the Los Padres National Forest headquarters at (805) 968-6640 or the Los Prietos Ranger Station at (805) 967-3481.